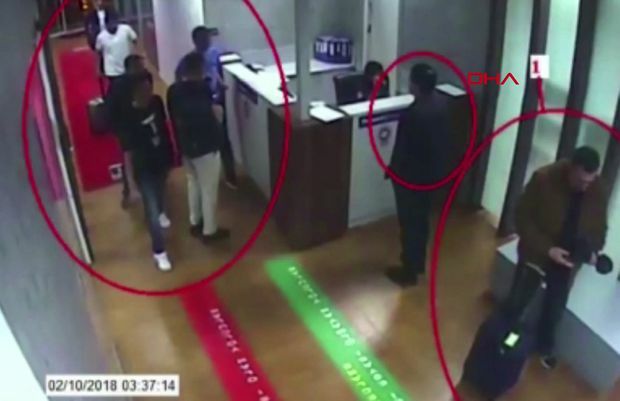 This video grab made on Oct, 10, 2018 from CCTV footage obtained from Turkish news agency DHA shows a Saudi team suspected of involvement in Saudi journalist Jamal Khashoggi's disappearance, at the airport in Istanbul on Oct. 2, 2018. Two Gulfstream jets carrying 15 Saudis landed at Istanbul’s Ataturk Airport before dawn on the day last week that journalist Jamal Khashoggi entered the Saudi consulate and vanished. The men checked into hotels and left Turkey later that night. Turkish media, which released surveillance camera video of the men on Wednesday, said they were members of an elite Saudi “assassination squad,” sent to kill Mr. Khashoggi. The Washington Post reported on Tuesday that U.S. intelligence had intercepted the communications of Saudi officials discussing a plan to capture Mr. Khashoggi, citing an unidentified person familiar with the information. The crown prince ordered an operation to lure Mr. Khashoggi back to Saudi Arabia from the United States and then detain him, the Washington Post reported on Wednesday, citing U.S. intelligence intercepts of Saudi officials discussing the plan. The Post said it was not clear to officials with knowledge of the intelligence whether the Saudis discussed harming Mr. Khashoggi as part of the plan to detain him in Saudi Arabia. Saudi Arabia has dismissed allegations it played a role in Mr. Khashoggi’s disappearance as “baseless,” but it has offered no evidence to support its contention he left the consulate unharmed last week and vanished into Istanbul while his fiancée, Hatice Cengiz, waited outside. The video, shown on the state-run broadcaster TRT and others, did not offer definitive proof about Mr. Khashoggi’s fate. Turkish officials have said that they fear the team killed him. More than 20 Republican and Democratic senators instructed Mr. Trump to order an investigation into Mr. Khashoggi’s disappearance under legislation that authorizes imposition of sanctions for perpetrators of extrajudicial killings, torture or other gross human-rights violations. While no suspects were named, and the lawmakers’ letter to the President is only a preliminary step in taking punitive action, it marked departure from decades of close U.S.-Saudi relations that have only intensified under Mr. Trump. Riyadh has supported the administration’s tough stand on Iran, a key rival of Saudi Arabia in the volatile Middle East. The Turkish security-camera video was reminiscent of the surveillance-video sleuthing done by officials investigating the assassination of a Hamas operative in Dubai in 2010 and the slaying of North Korean leader Kim Jong-un’s half brother in Malaysia in 2017. The footage shows some of the Saudis leaving a hotel and Mr. Khashoggi entering the consulate, walking past a black Mercedes van with diplomatic plates parked adjacent to the entrance. An hour and 54 minutes later, according to the time stamp, a black Mercedes van drives about two kilometres to the consul’s home, where it was parked in a garage. 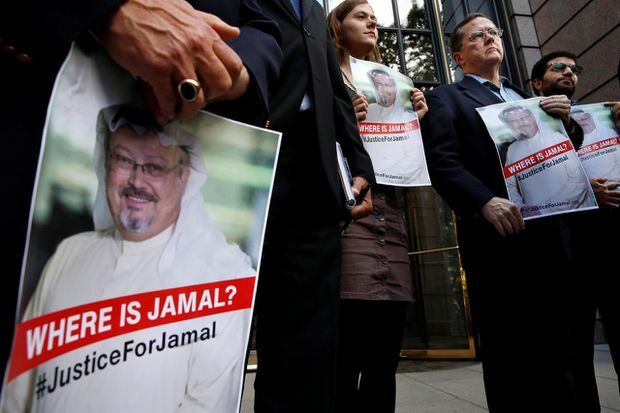 Alyssa Edling, centre, and Thomas Malia, second from right, both with PEN America, join others as they hold signs of missing journalist Jamal Khashoggi, during a news conference in front of The Washington Post, in Washington, D.C., on Oct. 10, 2018. The footage all seemed to come from surveillance cameras, which would have been located throughout the neighbourhood housing the Saudi consulate and other diplomatic missions. No footage has emerged of Mr. Khashoggi leaving the consulate. Two Turkish officials, speaking on condition of anonymity because the investigation into Mr. Khashoggi’s disappearance was incomplete, confirmed the authenticity of the images in the Turkish media. One of the officials describes a member of the Saudi team as an “autopsy expert” amid earlier allegations that Mr. Khashoggi had been killed and dismembered. Mr. Khashoggi had written a series of columns that were critical of Saudi Arabia’s assertive Prince Mohammed, who has led a widely publicized drive to reform the conservative Sunni monarchy but has also presided over the arrests of activists and businessmen. Mr. Erdogan has not accused Saudi Arabia of being responsible for Mr. Khashoggi’s disappearance but has said that if the Saudis have video footage of him leaving the consulate, they should release it. Saudi Arabia is a major investor in Turkey, despite Ankara’s support for Qatar, a Gulf nation that is under a blockade led by Saudi Arabia and three other Arab countries. Police and investigators in Turkey typically release video and information through state-run or otherwise government-friendly media outlets, as opposed to holding briefings like those common in Western countries. On Wednesday, The Washington Post published a column by Ms. Cengiz, who said her fiancé first visited the consulate on Sept. 28 “despite being somewhat concerned that he could be in danger.” He returned there Oct. 2 after being promised the necessary paperwork so the two could be married. 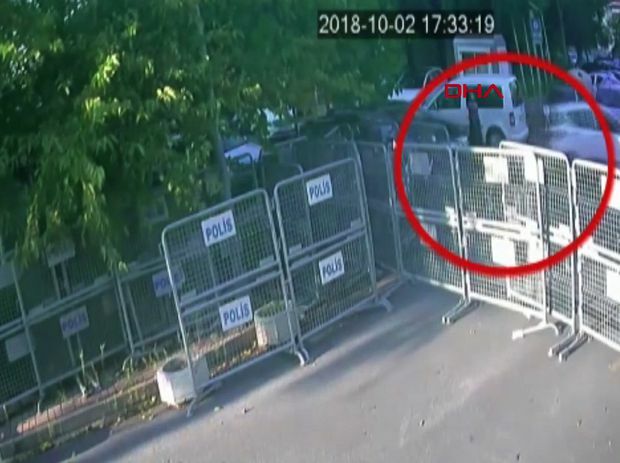 This video grab made on Oct. 10, 2018, from CCTV footage obtained from Turkish news agency DHA, shows the fiancee of Saudi journalist Jamal Khashoggi in front of the Saudi Arabian consulate, in Istanbul, on Oct. 2, 2018, the day Khashoggi went missing. Mr. Khashoggi had sought to become a U.S. citizen after living in self-imposed exile since last year, fearing repercussions for his criticism of Prince Mohammed, Ms. Cengiz wrote. Turkish Foreign Ministry spokesman Hami Aksoy said Tuesday that Saudi authorities have notified Ankara that they were “open to co-operation” and would allow the consulate building to be searched. It’s unclear when such a search would take place. Embassies and consulates under the Vienna Convention are technically foreign soil and must be protected by host countries. Saudi Arabia may have agreed to the search in order to reassure its Western allies and the international community.